We are a club of recreational and touring kayak paddlers, based in Chesterville in eastern Ontario, Canada. We enjoy some of the best paddling there is in the Ottawa and St.Lawrence River valleys. The South Nation River at Chesterville, Ontario is our home. For great paddling and fun, join us on the water. All are welcome. Note: Tuesday, April 9th, 2019 will be our next meeting. Check out our Facebook page for member activities and event photos. We hope to see you all in the 2019 paddling season. ​at the Royal Canadian Legion, 167 Queen Street, Chesterville, ON. 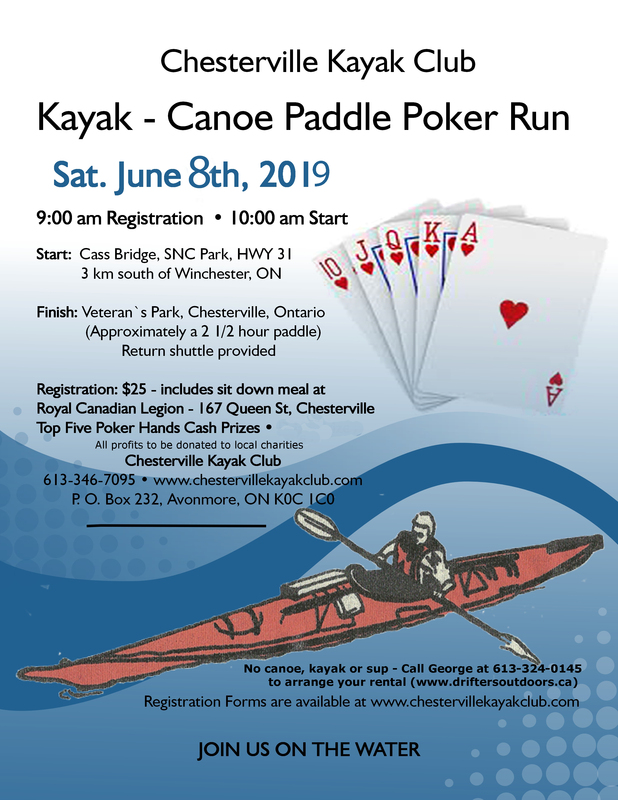 Join us for a fun filled day of paddling at our 8th annual Kayak - Canoe Paddle Poker Run. There will be a sit down meal and prizes afterwards at the Royal Canadian Legion, 167 Queen Street, Chesterville. Register the day of the event at 9am in the morning, or print the above form and register in advance, by mail. For a larger view of all information, please click the poster at right. All profits to be donated to local charities. It's been a long and unusually cold winter, but spring is just around the corner. Before you know it, we'll be breaking out the boats and paddles again. It won't be long before the paddling season is in full swing. For current watershed information on the South Nation River go to South Nation Conservation. Check the Facebook page for upcoming events and information. 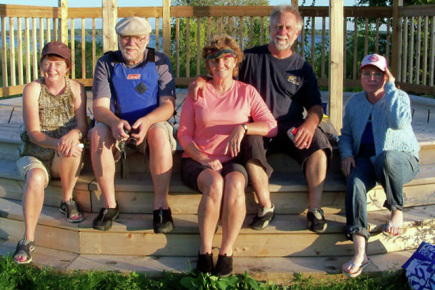 Much has been accomplished in the past, from the raffle of a nine foot carving of a wooden bear to raise funds for the Canadian Cancer Society, to a raffle of a kayak in support of the new Chesterville Waterfront Development. This past year, in August 2016, the club supported the annual "Kayaking for Cancer" run on the historic Rideau Canal Waterway with a donation of $100 through a local paddler. A donation of $400 was made to a Rotary Club led community initiative to purchase new Christmas lighting for downtown Chesterville. The club also provided a portable washroom for the 2016 boating season, located at Veteran's Park, Chesterville. I don't know where we find all the time for paddling and friendship. I look forward to another year both on and off the water, with all of you.
" 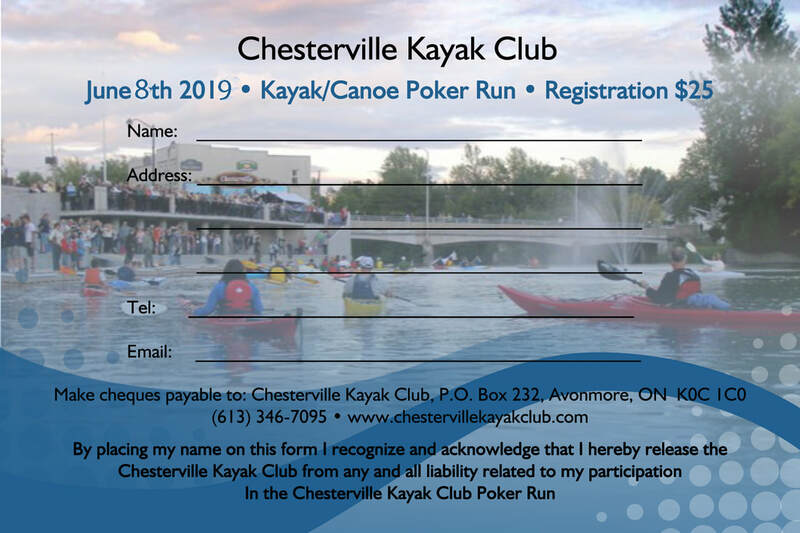 For Great Paddling and Fun "
Grand opening of the Chesterville waterfront !